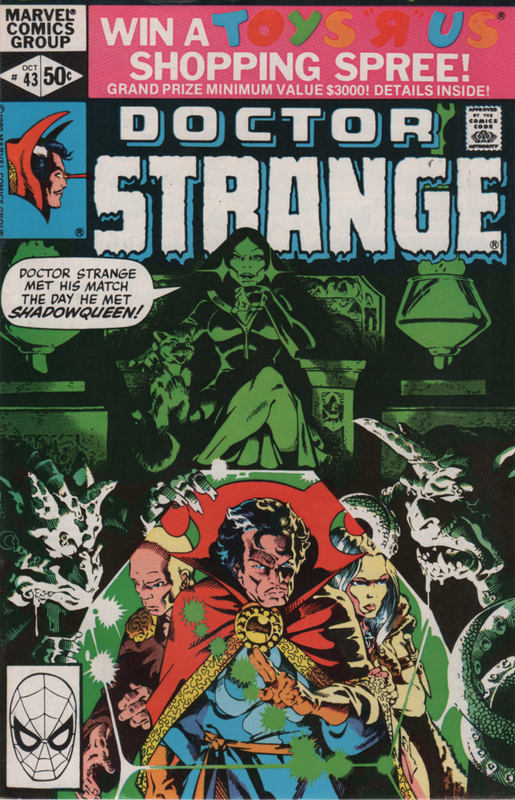 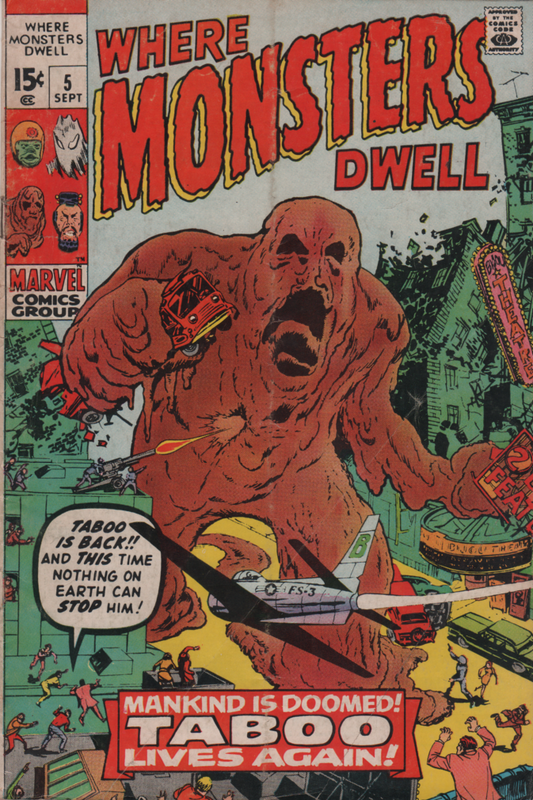 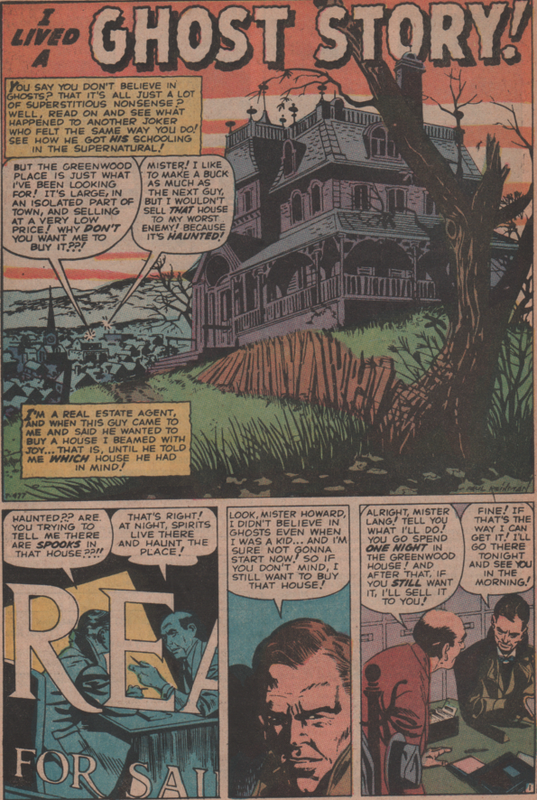 Marvel Comics | Magazines and Monsters! 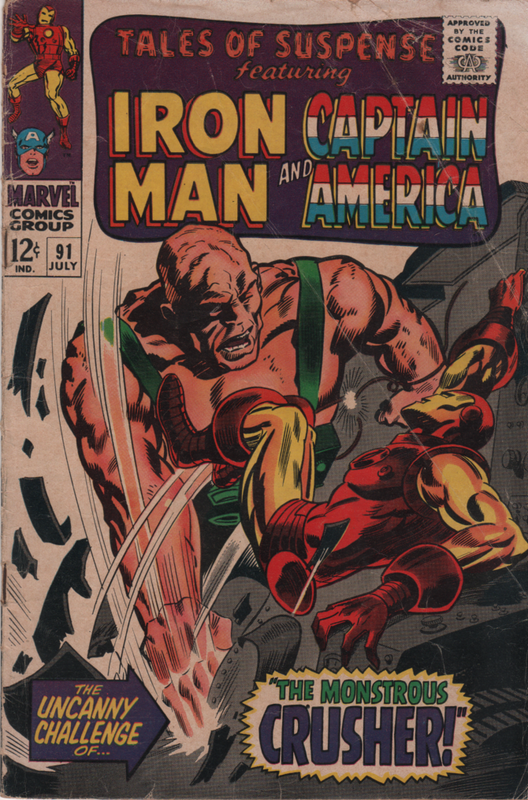 It’s always cool to get a good deal on a comic/magazine. 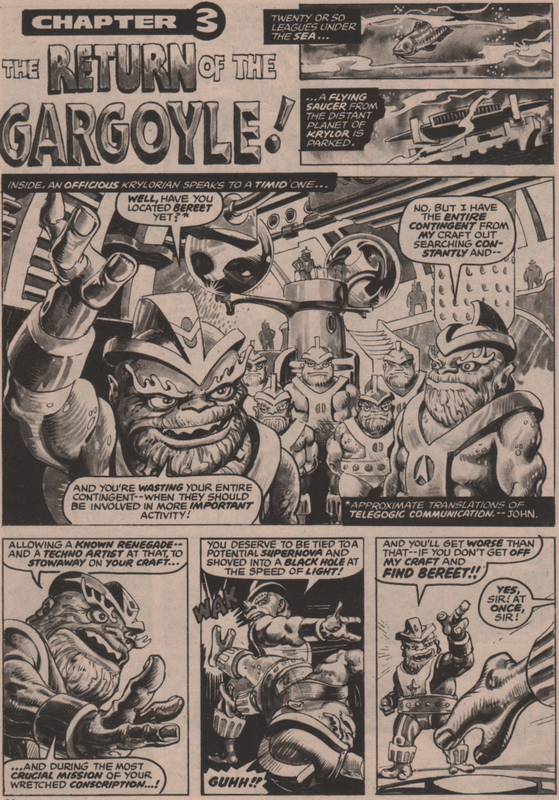 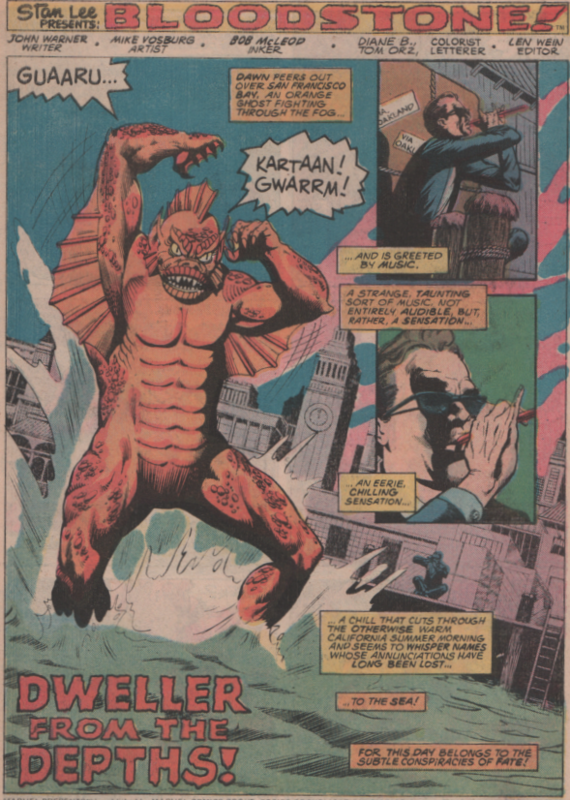 It’s even better when it’s a “Pulse-Pounding First Issue!” Admittedly, this post is sort of a continuation from last week, as the back up story in this magazine is the next chapter in the comic book life of a certain monster hunter. 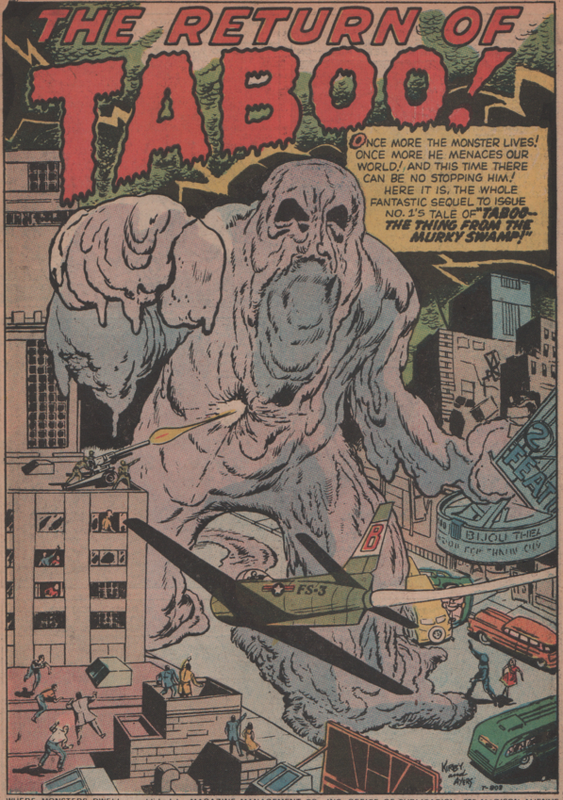 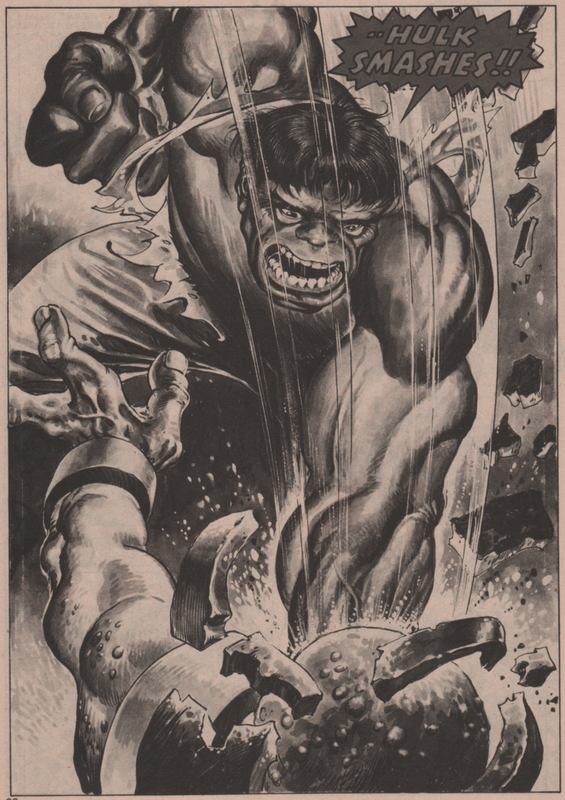 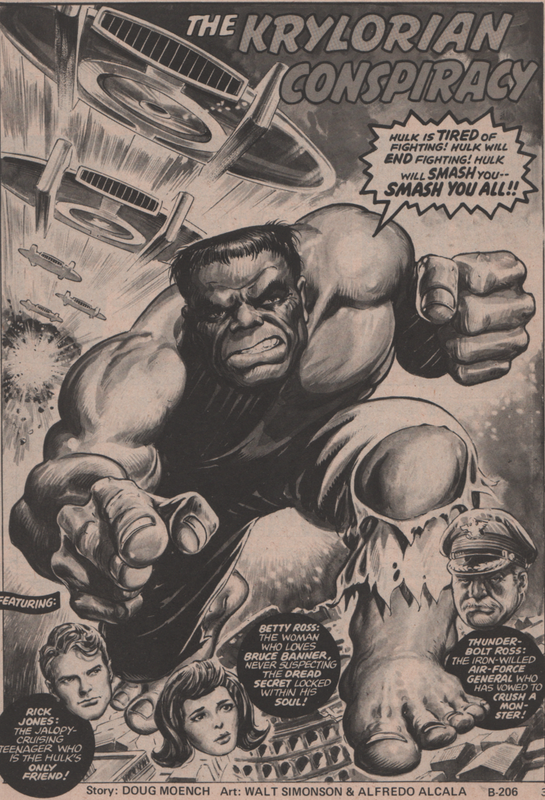 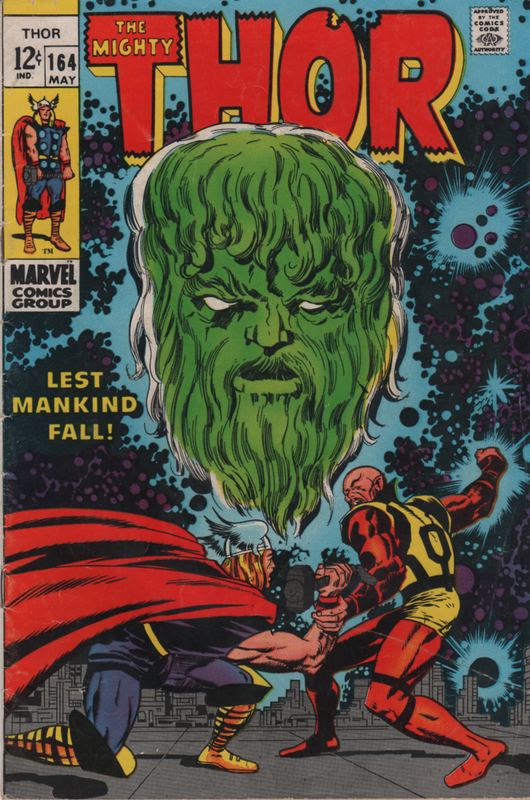 But that’s for later, as first, we must see what’s going on in the life of the Jade Giant, The Hulk! 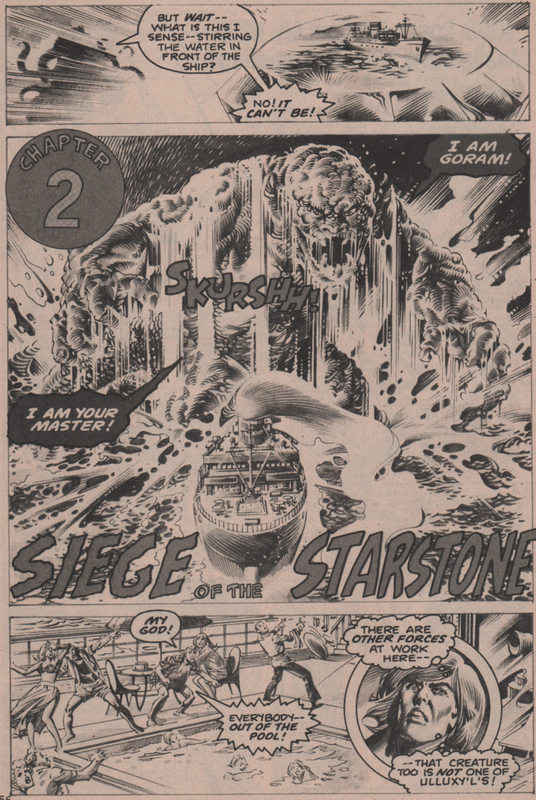 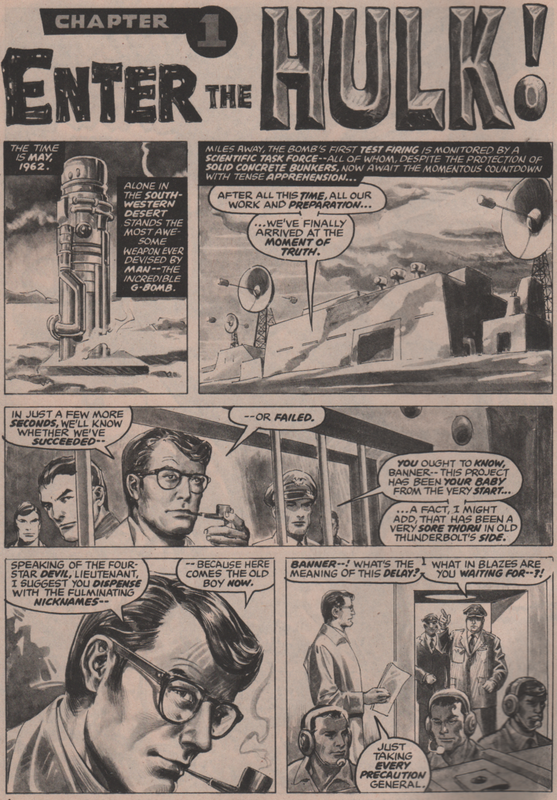 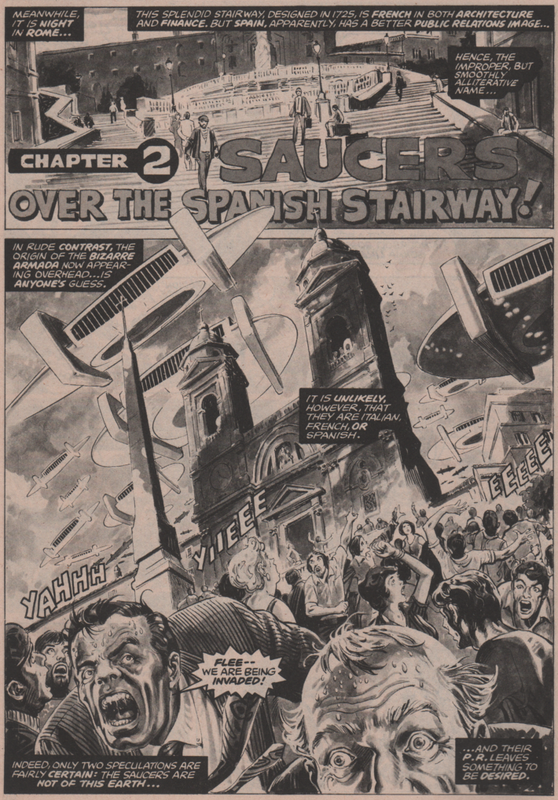 The firs story in this incredible mag is a tale of the Hulk and Rick Jones, as they investigate an alleged flying saucer in Spain! 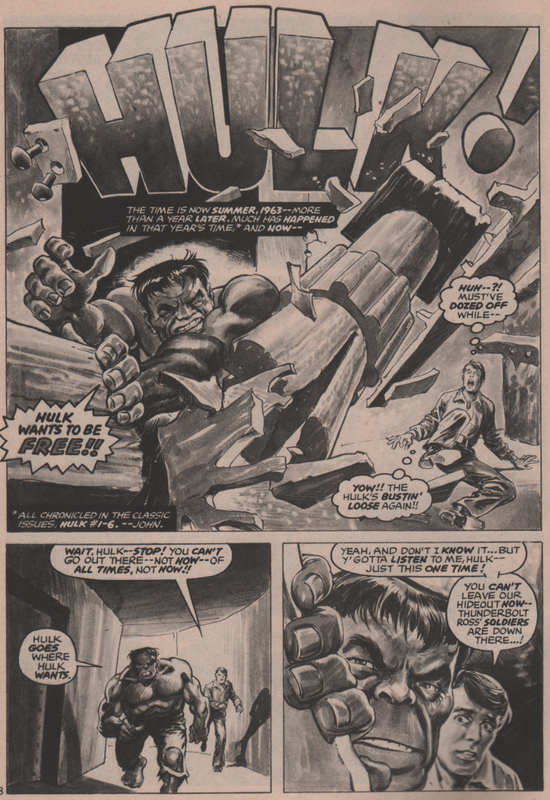 We actually get a re-telling of the Hulk’s origin first (in a couple of glorious pages), then the main story. 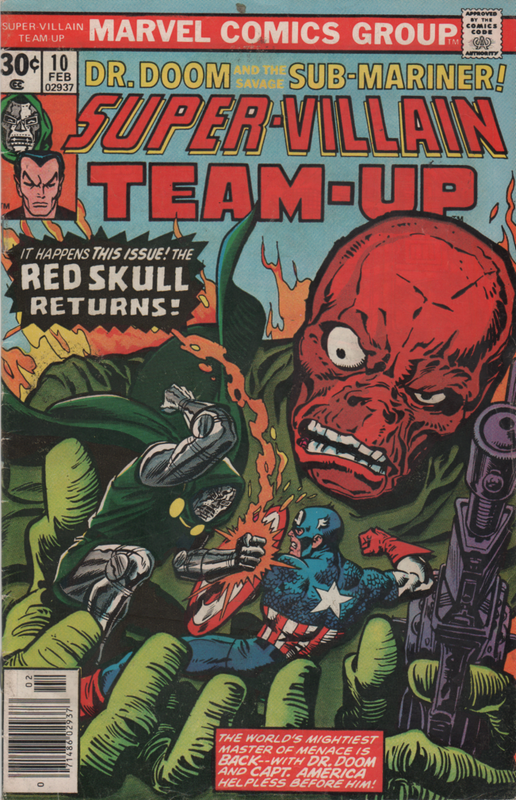 We see everything you could want in this one. 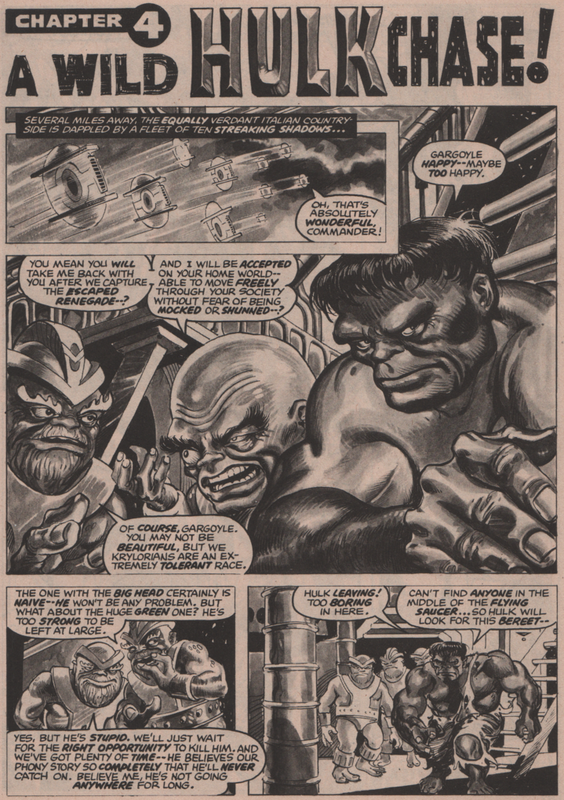 Betty, Thunderbolt Ross, Rick Jones, The Gargoyle, an alien and of course the Hulk (and puny Banner)! 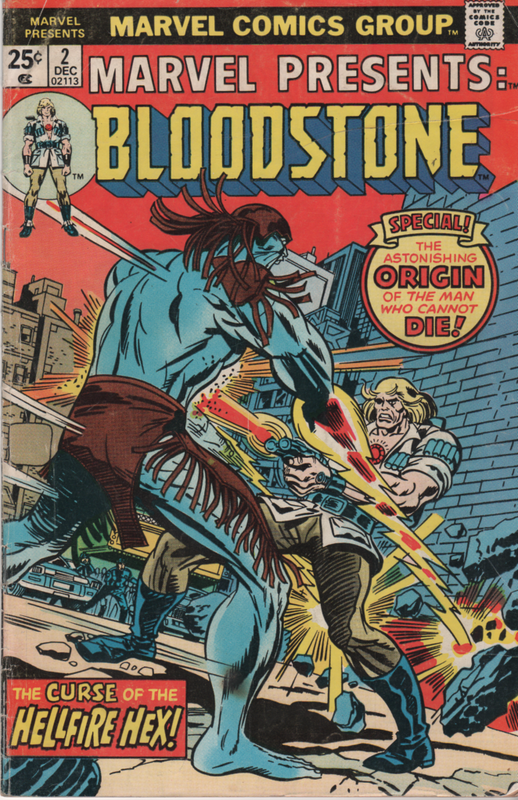 This one has a good story by Doug Moench, and incredible artwork by Walt Simonson (pencils) and Alfredo Alcala (inks)! 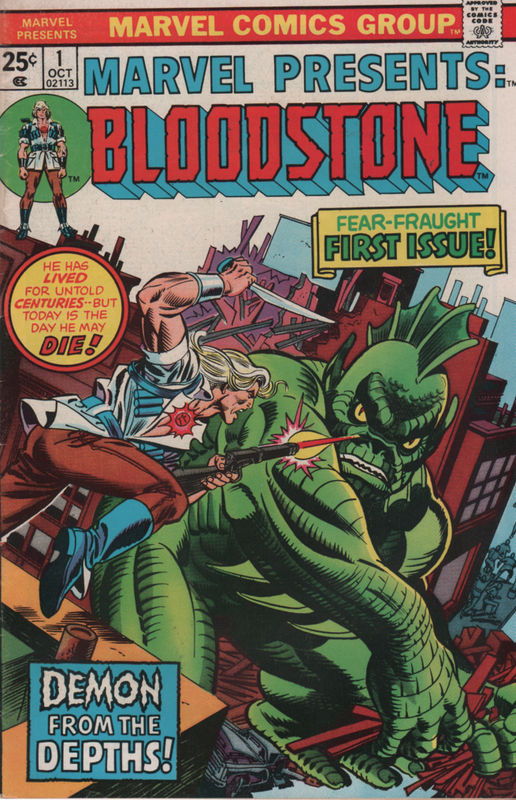 The second tale involves that monster hunting madman, Ulysses Bloodstone! 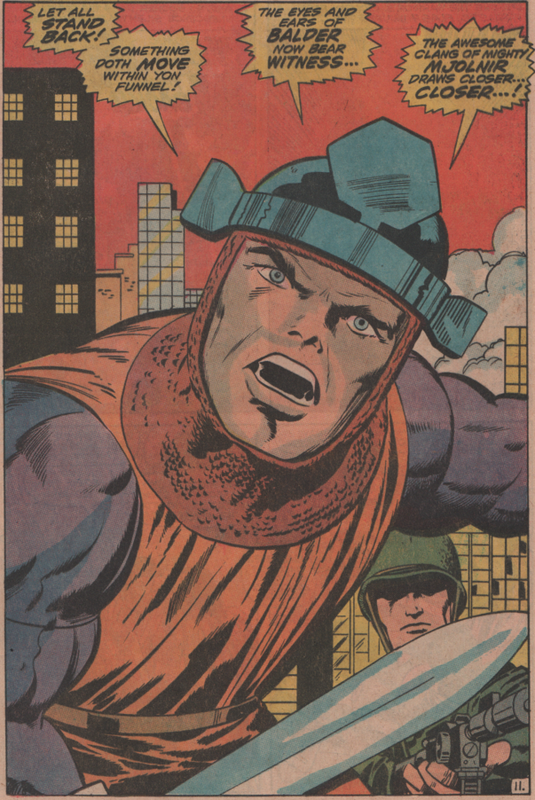 Last week’s post familiarized you (hopefully) with the character, now see him in all his glory as he battles aliens that have come to…do…something! 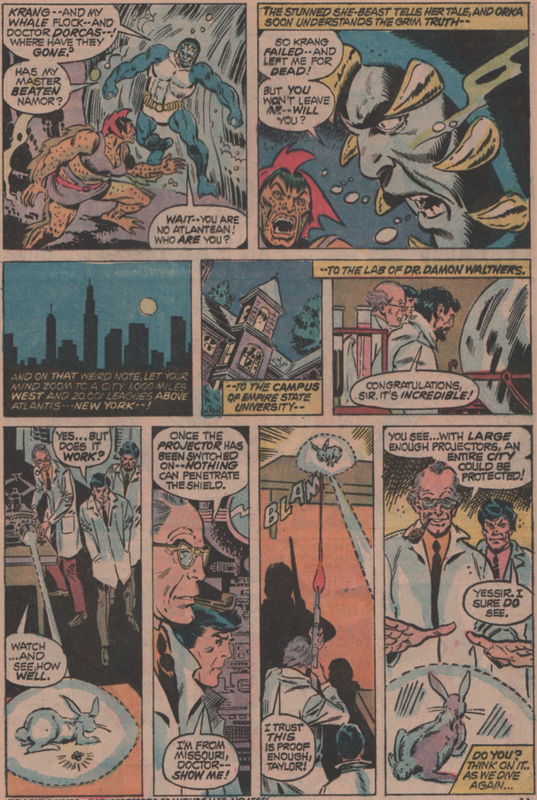 No, really, it’s more of a continuation of his search for answers, and then being attacked by a giant lizard creature and his old nemesis, Ulluxy’l. 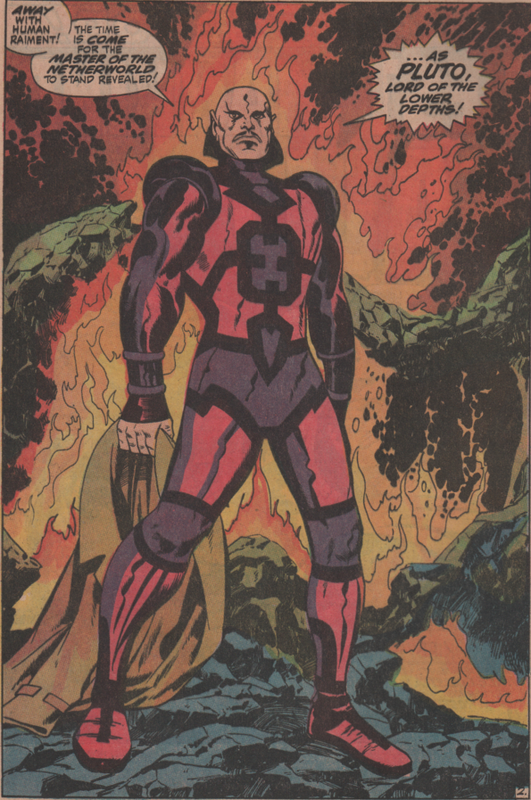 Special guest appearance by Killer Shrike! 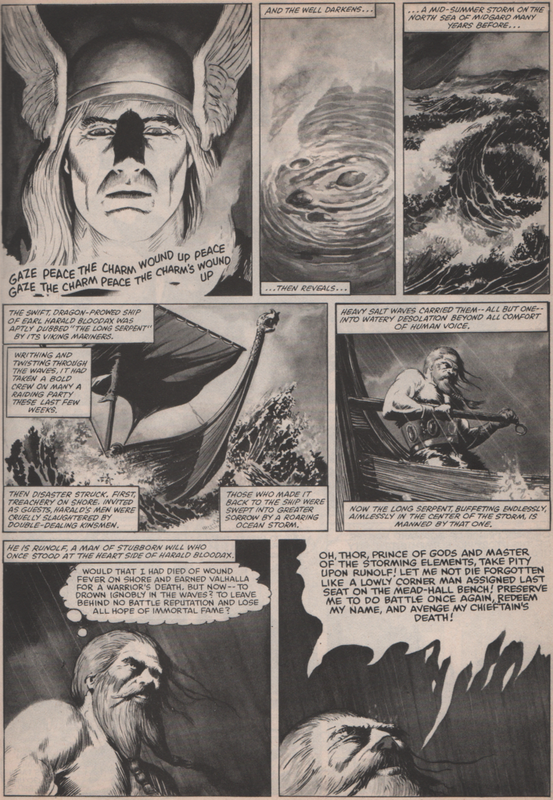 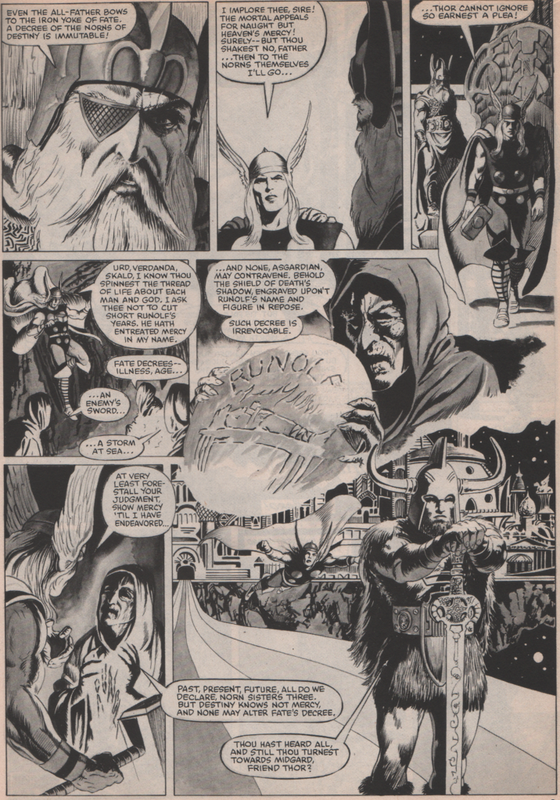 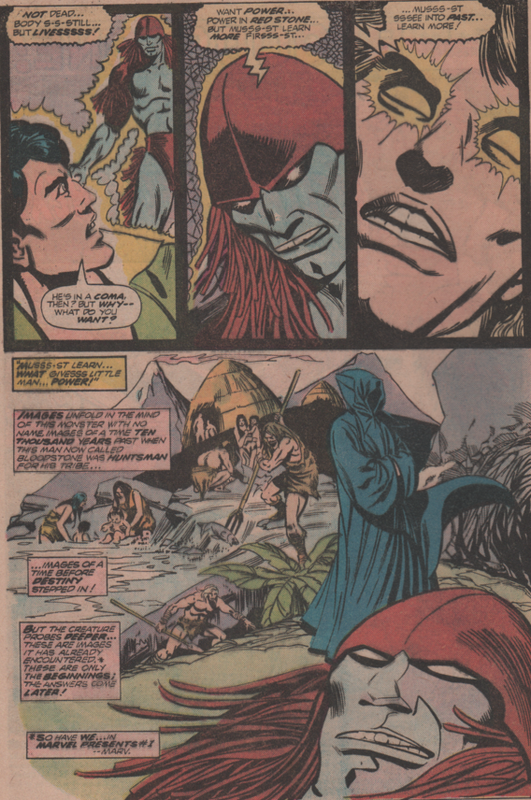 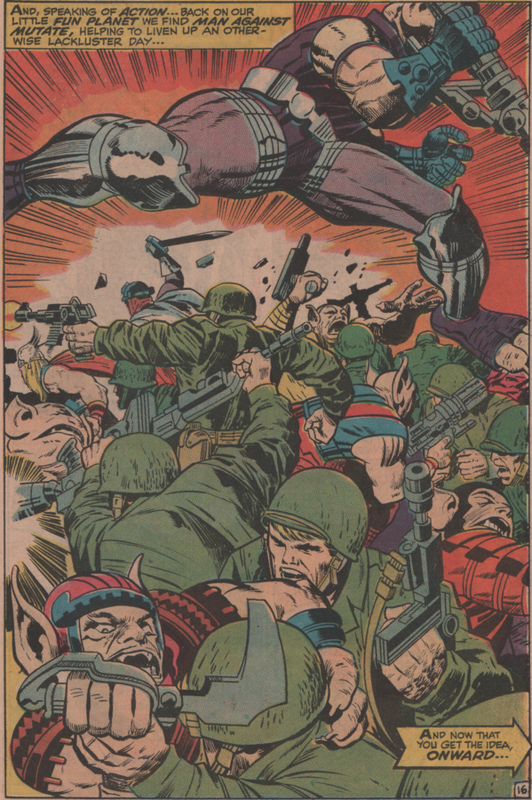 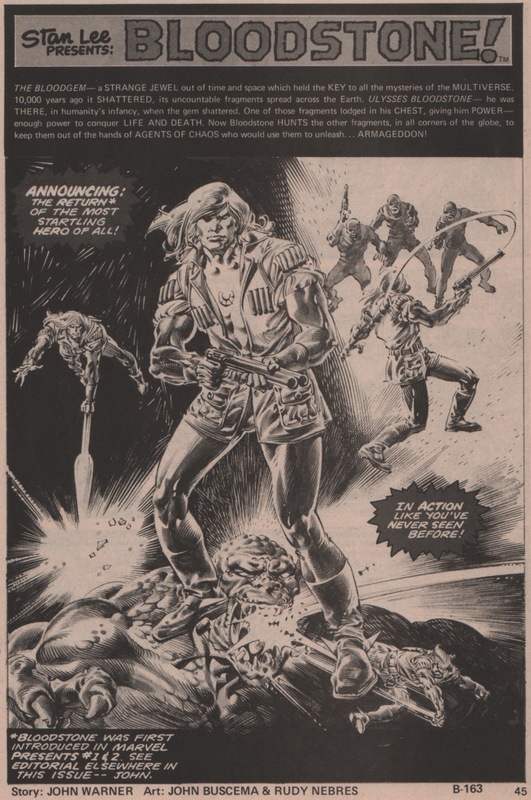 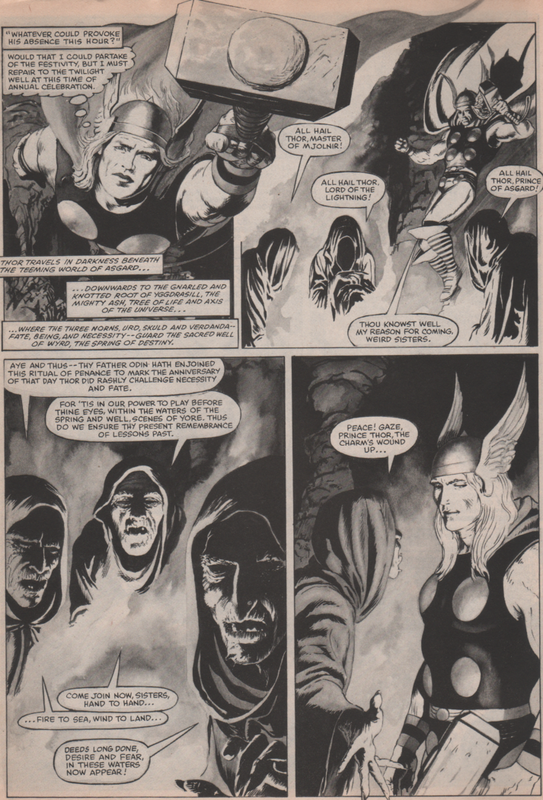 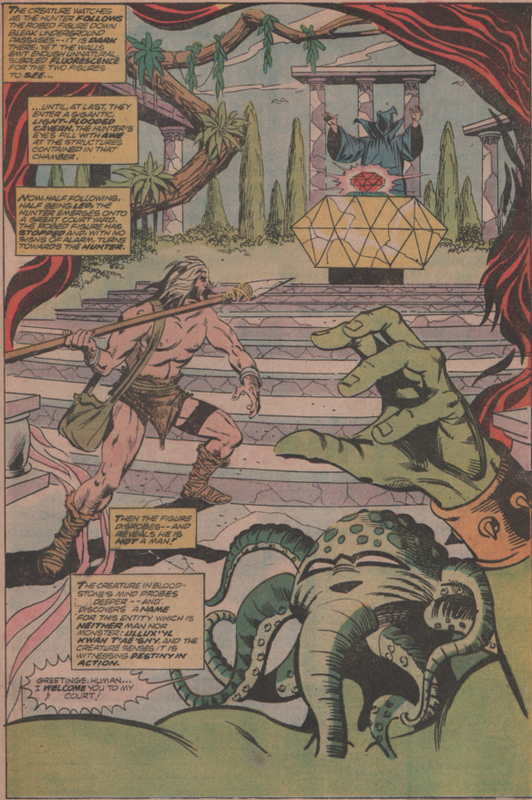 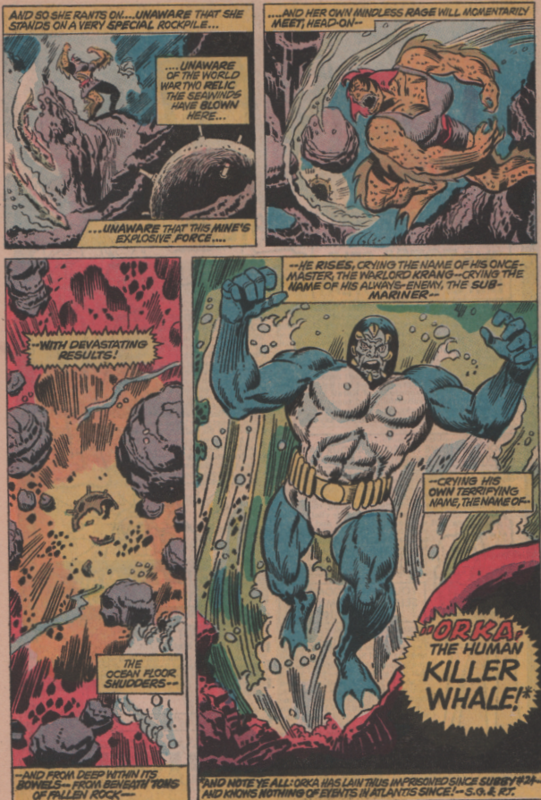 Written by John Warner, art by “Big” John Buscema (breakdowns) and Rudy Nebres (finishes)! 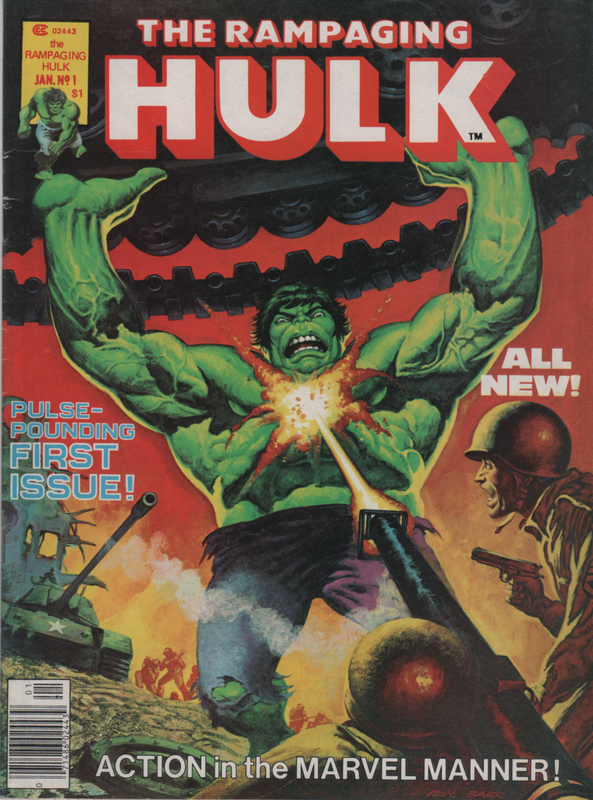 The incredible cover is by Ken Barr (one of the best painted covers of the entire series!). 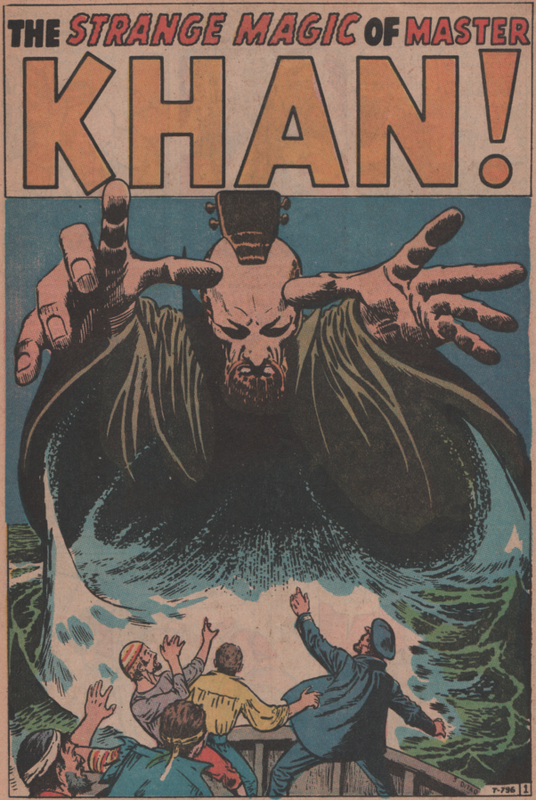 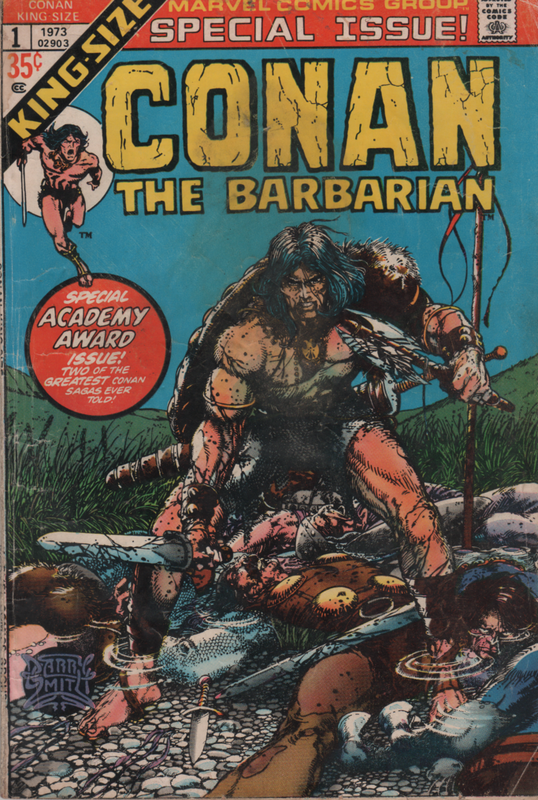 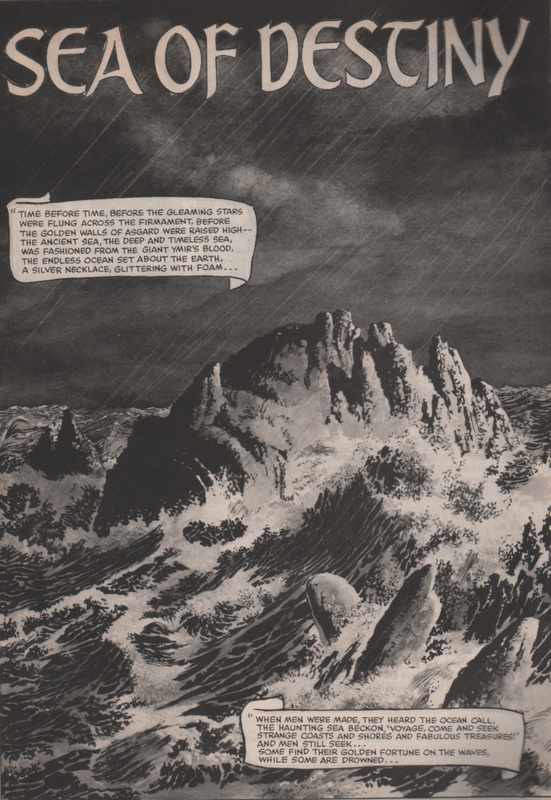 Conan, a character that’s been in publication since 1932…think about that for a minute. 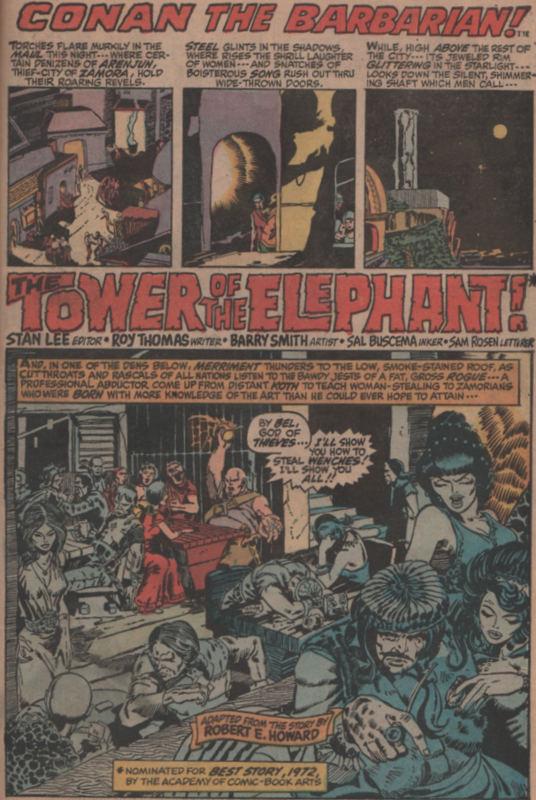 The Great Depression, angst, suicides by businessmen losing their life savings, five years before Tolkien published The Hobbit, and a lifetime before creators gave us galaxies far, far away, Robert E. Howard created an entire world. 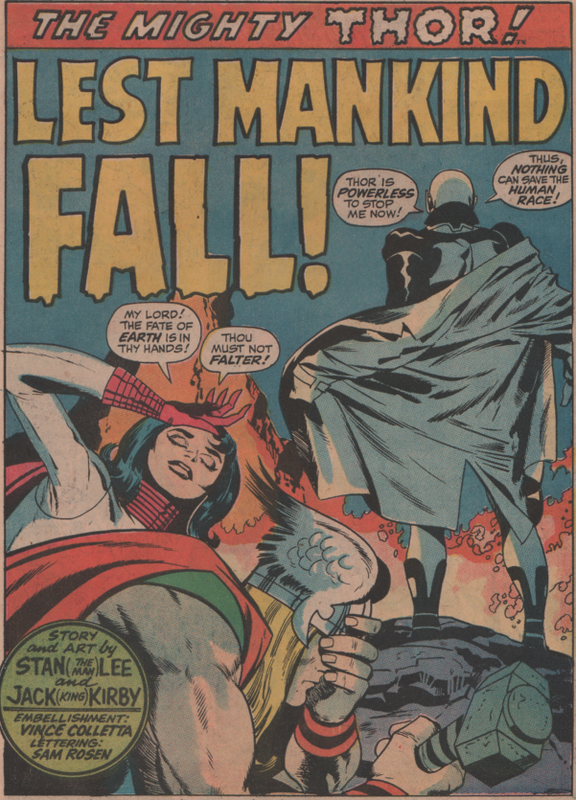 The contributions this man gave the world are still terribly underappreciated. 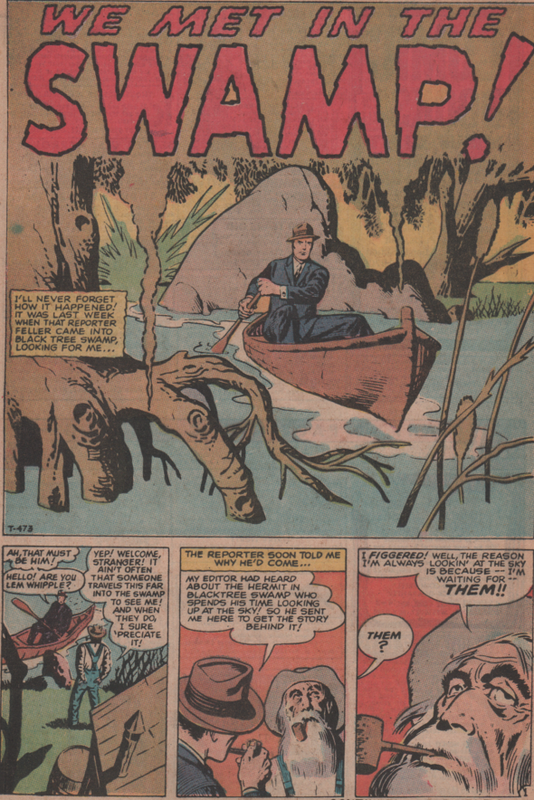 Anyone that’s not very familiar with his work, definitely give a look at his biography here. 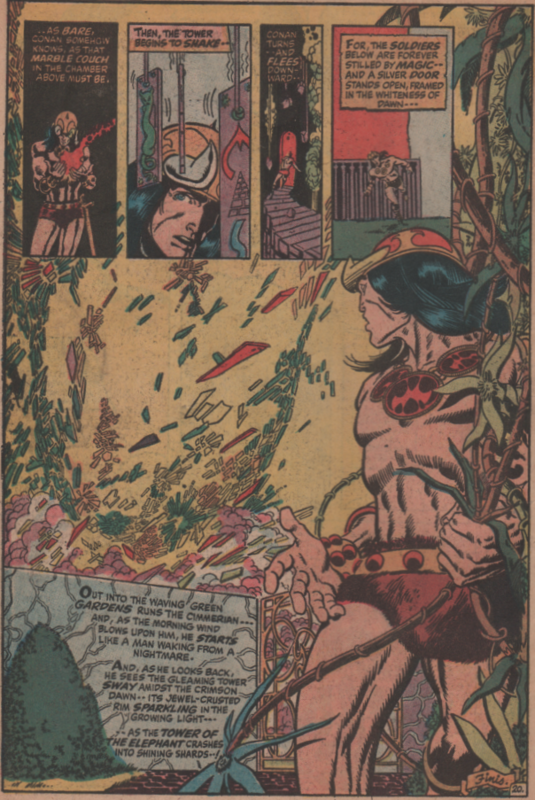 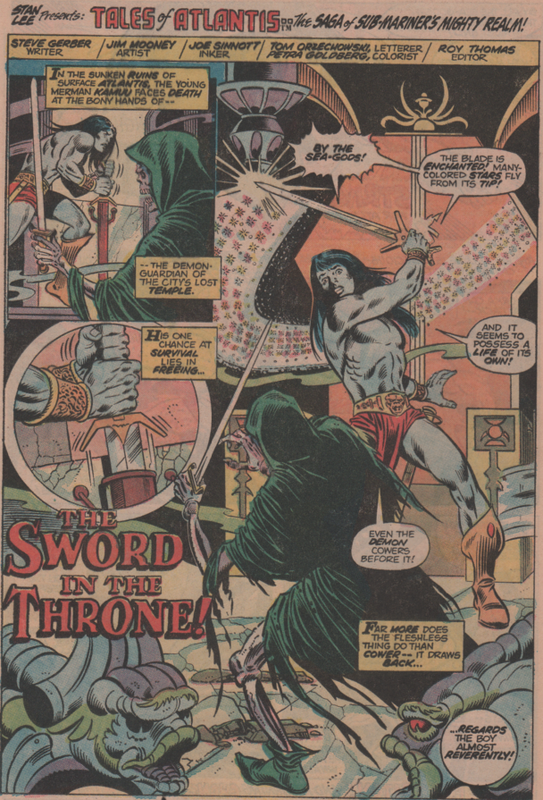 When Roy Thomas secured the rights to publisher Conan from the REH estate, the greatness was there immediately. 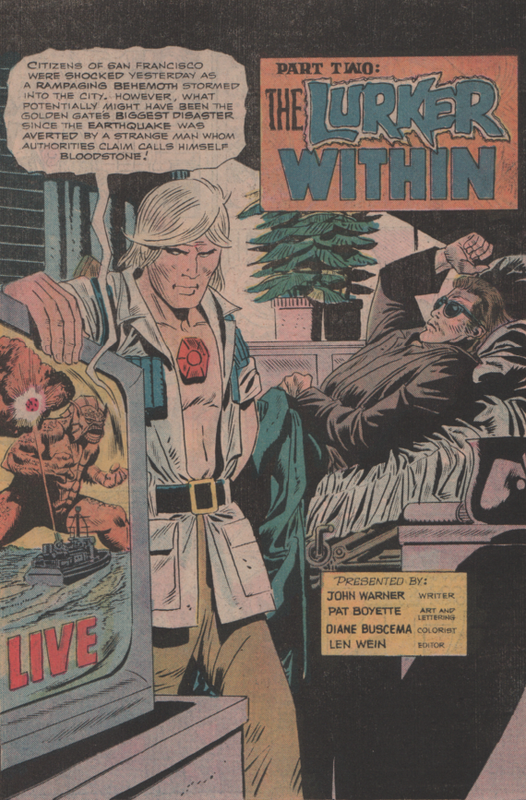 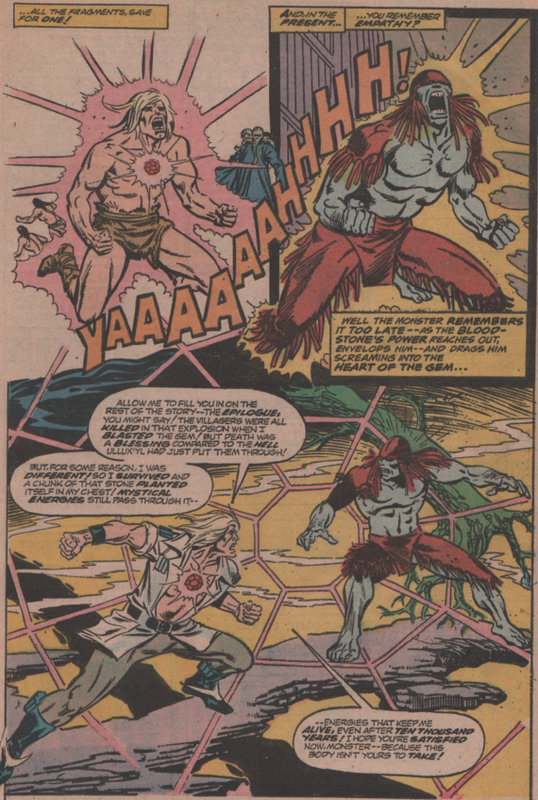 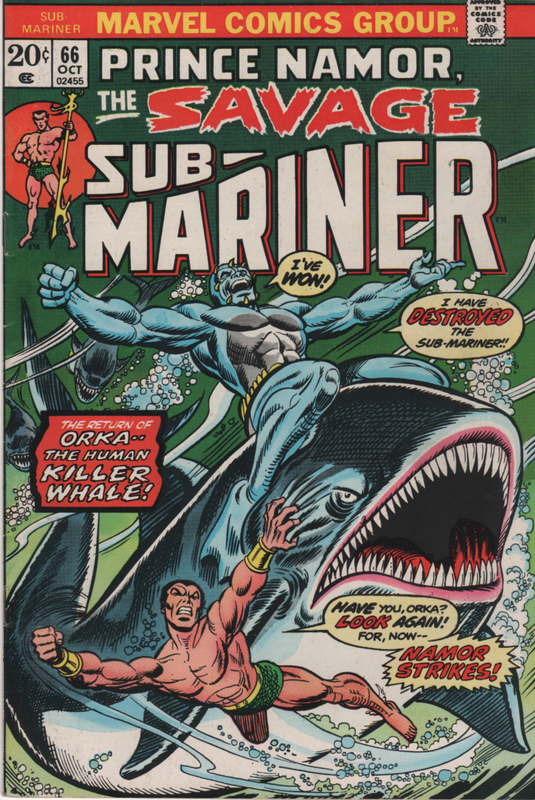 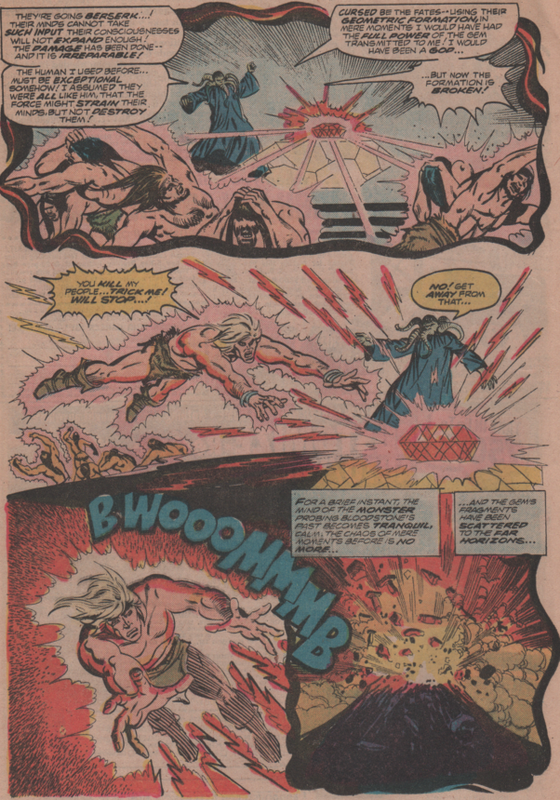 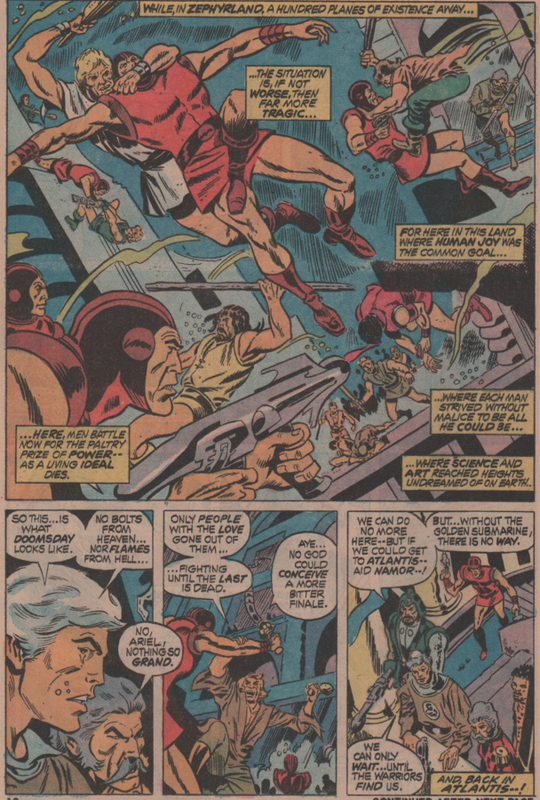 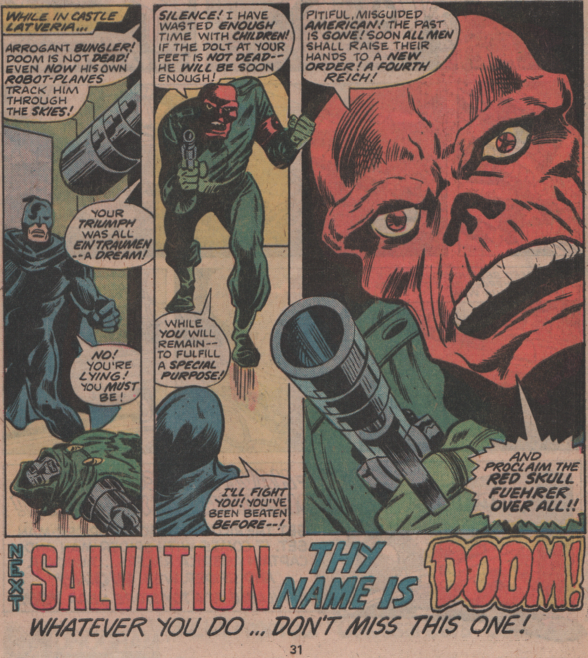 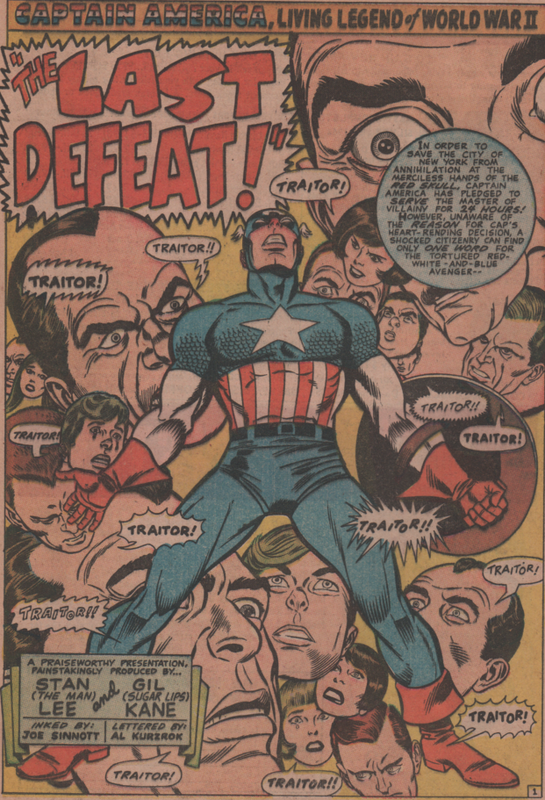 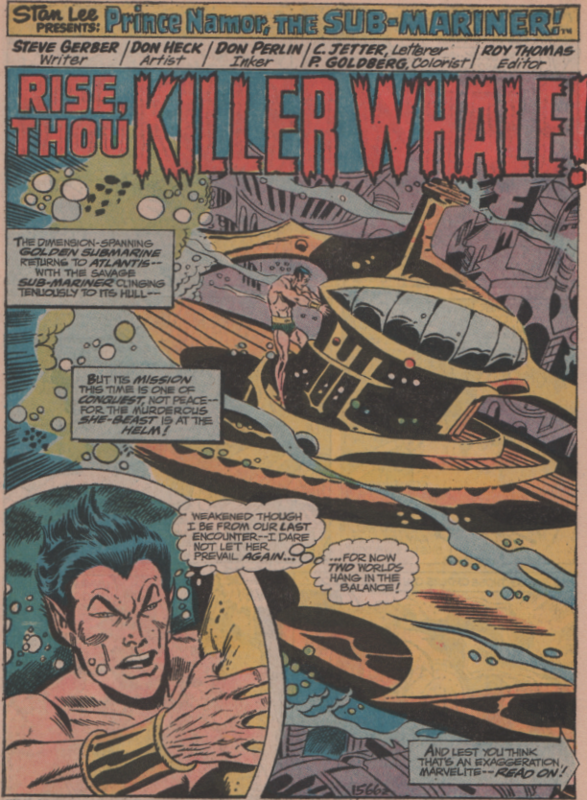 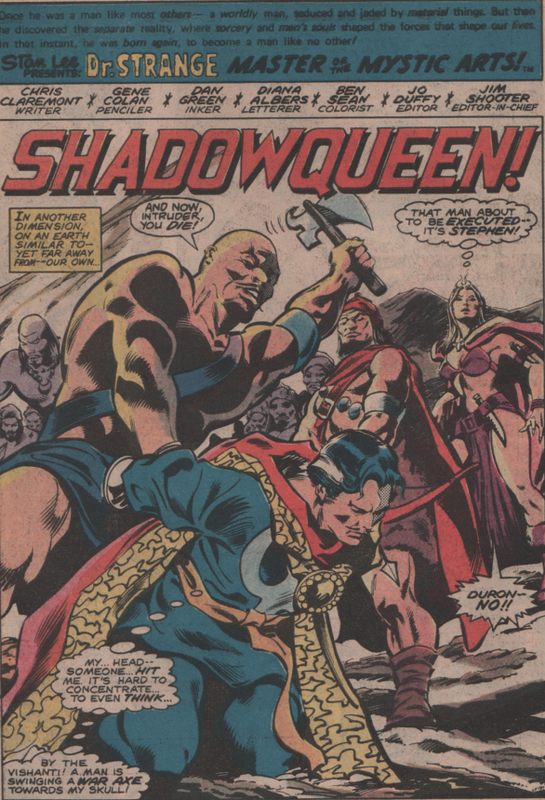 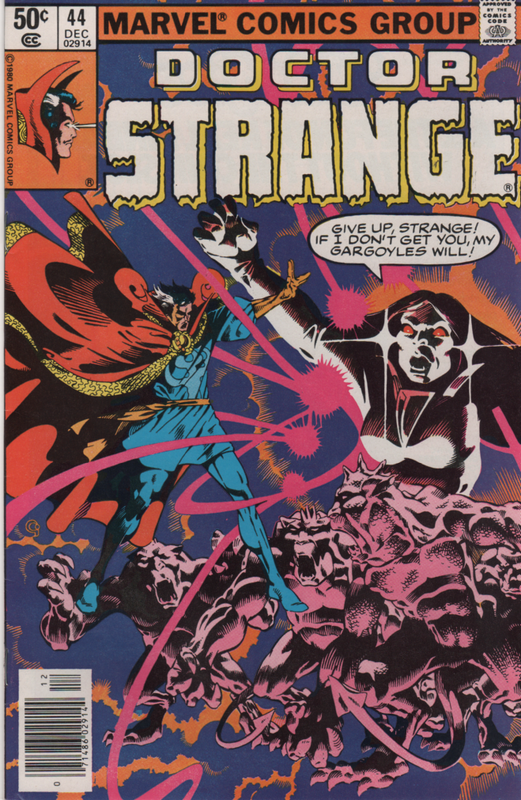 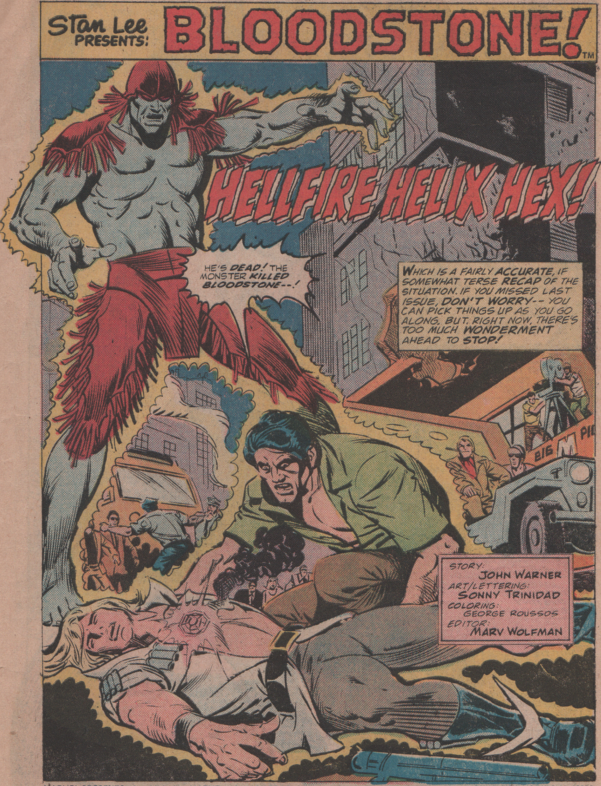 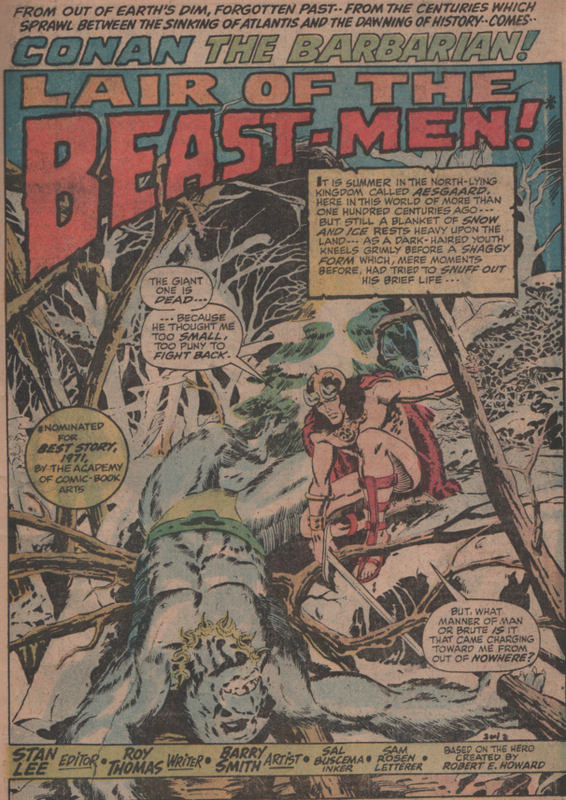 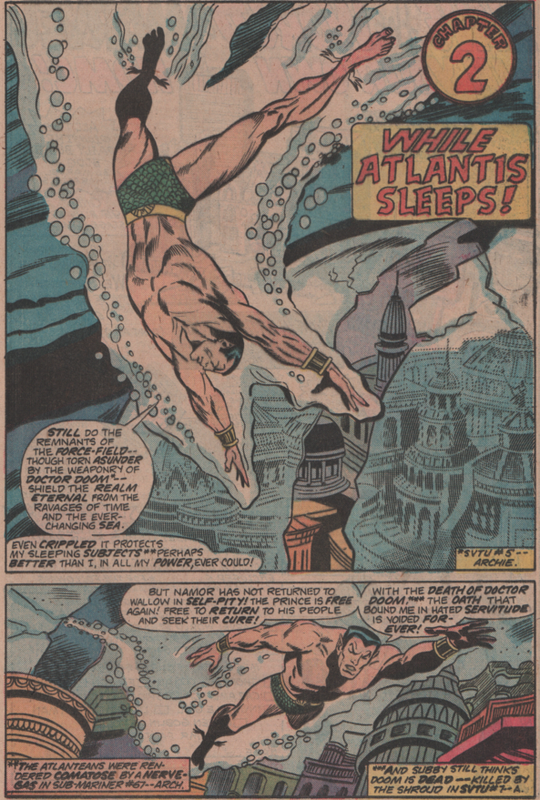 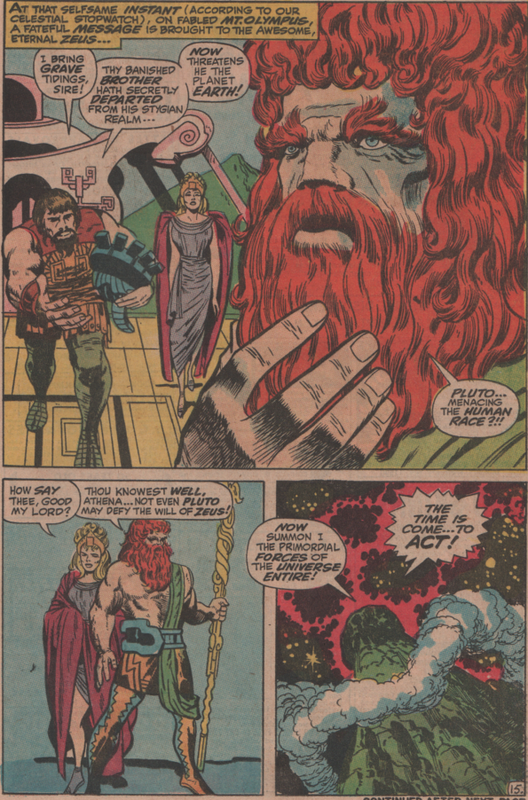 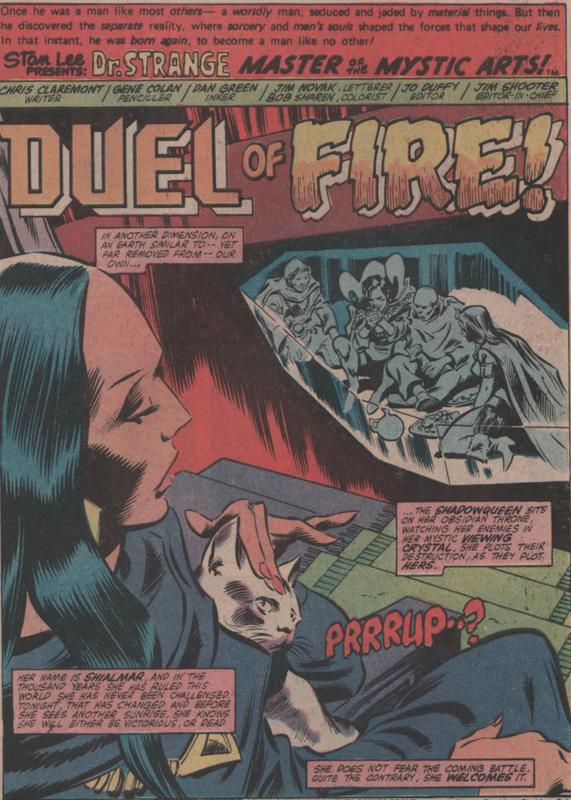 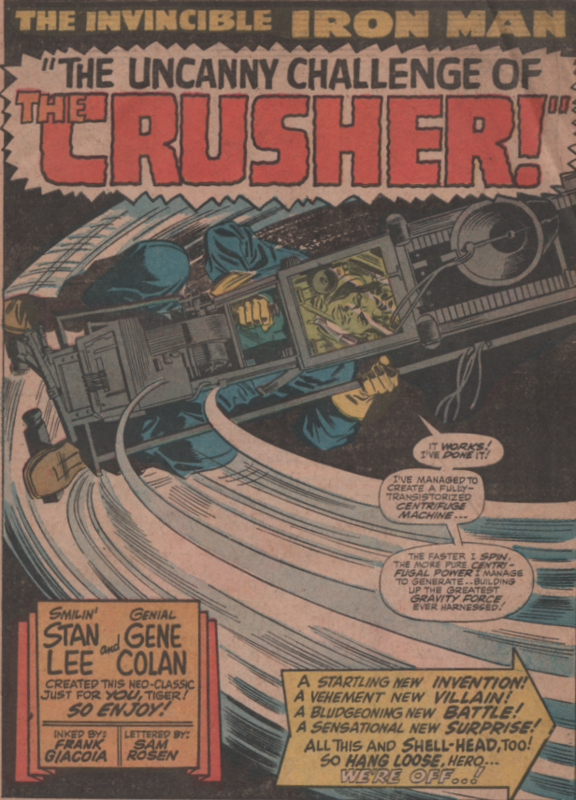 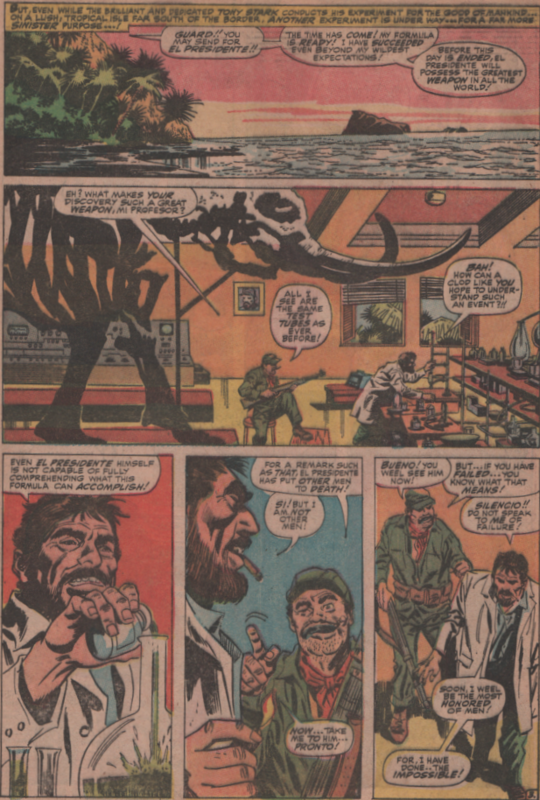 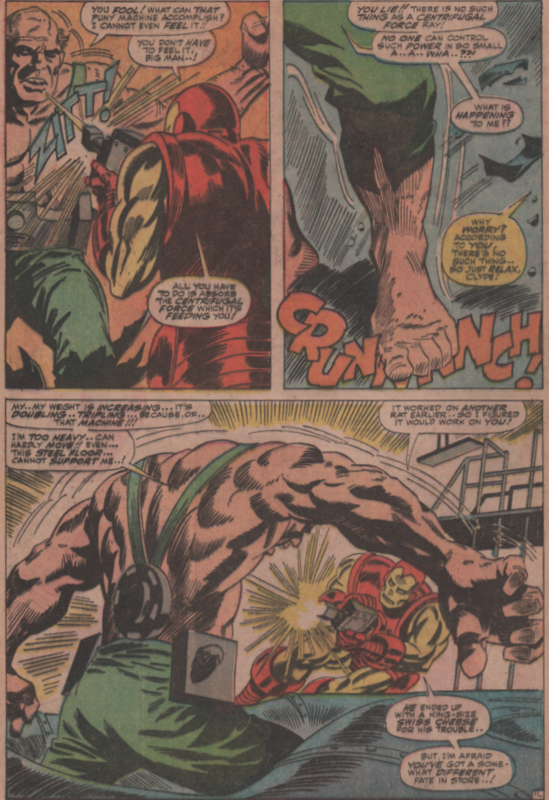 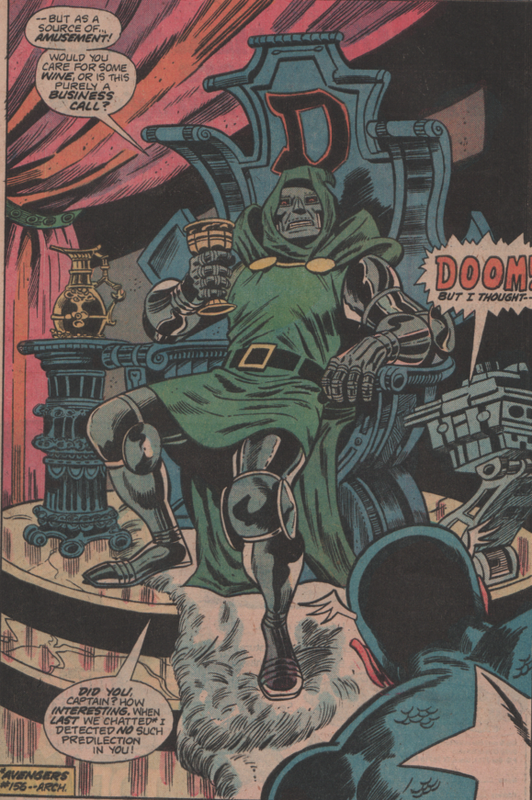 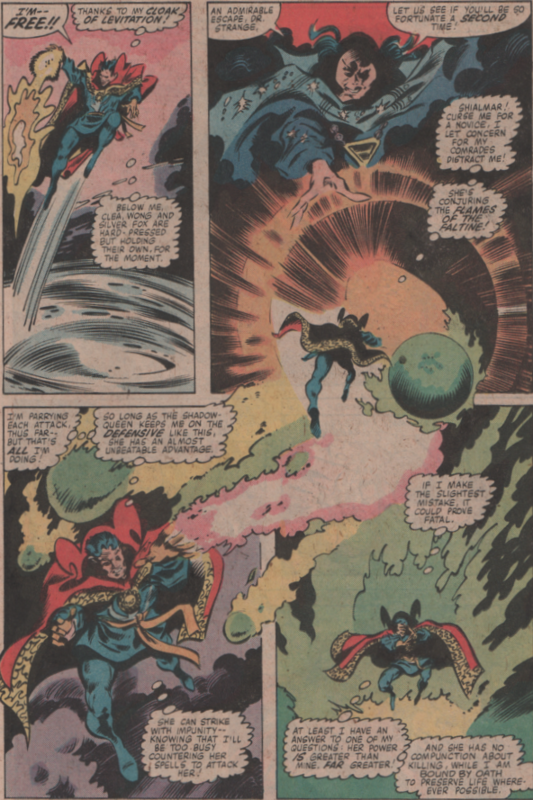 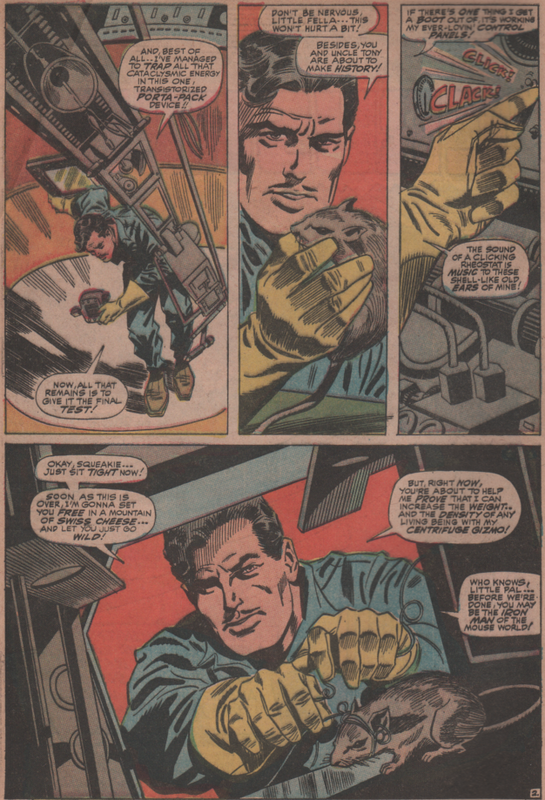 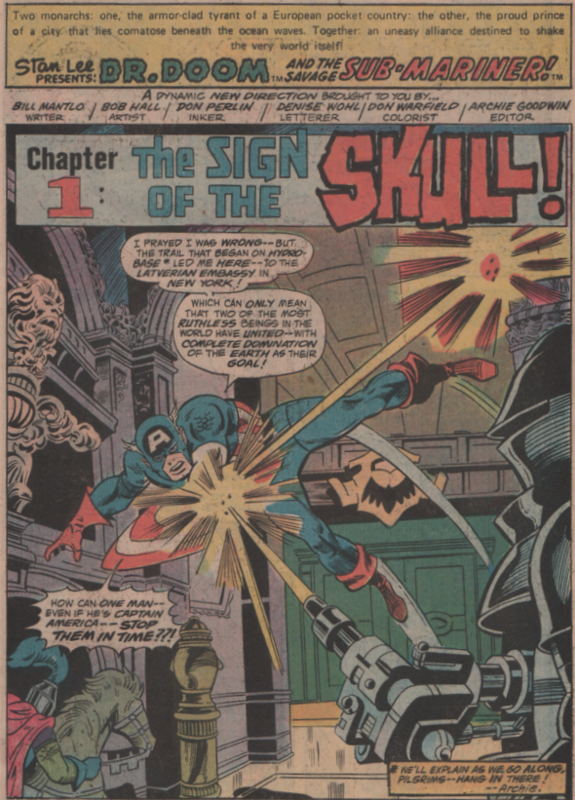 With Roy Thomas writing, and Barry (Windsor) Smith (and most notably Sal Buscema inking, with others) on art, the character was off and running! 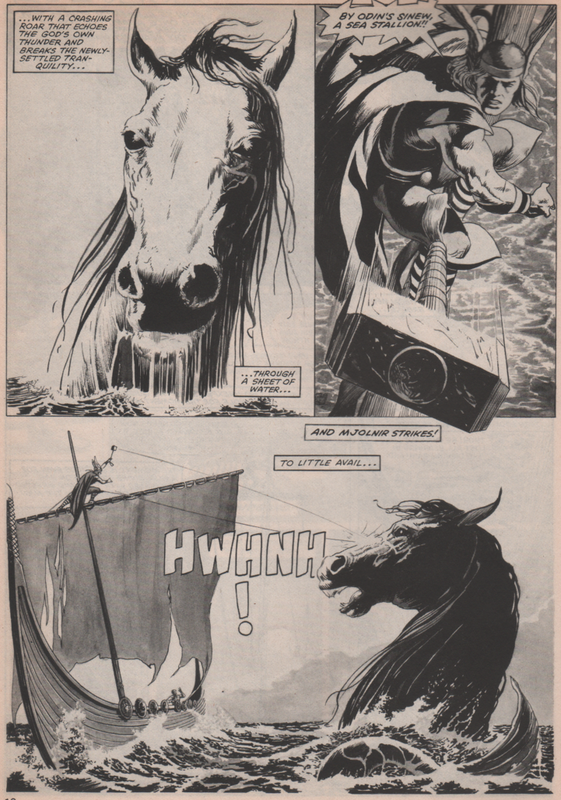 What followed the great run by BWS wasn’t half bad either (some say even better), but that’s a tale for another day. 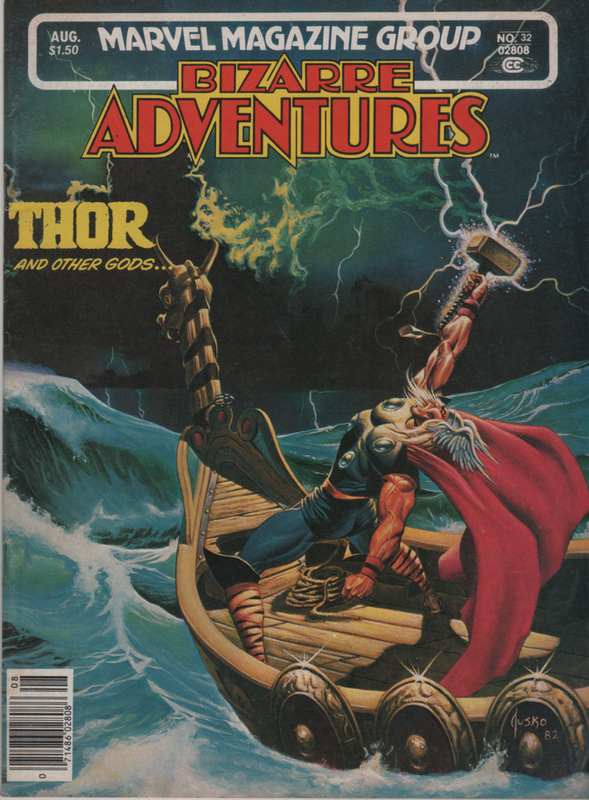 You get material from the second and fourth issues of the series in this book and both are legendary stories by Howard!